Dutch geosciences company Fugro has denied that the search for missing Malaysian Airlines flight MH370 has been conducted in the wrong place. Reuters yesterday quoted Fugro figures as saying that the chosen search area assumes the plane met a sudden end, but that if the crew were awake the plane could have glided well beyond the current search area. It's long been assumed that whatever happened to the Beijing-bound plane incapacitated the crew and led to it flying until it ran out of fuel, somewhere in the south of the Indian Ocean. The search area, depicted below, was determined after analysis of data including seven satellite handshakes. 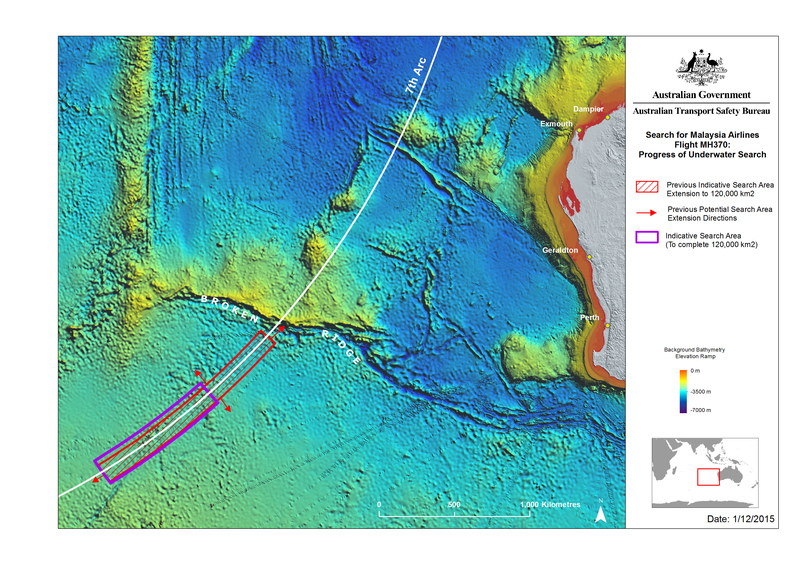 The search zone is in a part of the ocean in which Australia has responsibility for search and rescue operations, so the nation's Transport Safety Bureau (ATSB) has conduct of the search. Chinese and Malaysian authorities are assisting the search, which has covered nearly 110,000km2 of the 120,000km2 search area. Families of the missing passengers are understandably dissatisfied with progress, while some aviation pundits continue to argue that a different fate befell the aircraft. Hence the potential explosiveness of the Reuters story: two years of wasted effort would not be welcome! That's Fugro's bolding, by the way.